I am realizing I’m far more opinionated than I thought, great lesson for me to learn about myself. Blogging is a fabulous platform to express ones opinions huh? What plagues my thoughts often are how blind our society is towards all the subconscious messages bombarding our minds all day long. It’s everywhere we turn. Sports, Schools, Advertisements, Friends, Internet, etc…And how we just accept these messages without much thought, regardless if it’s in our best interest. Or the best interest of the next generation. But that wouldn’t sell more burgers….so a threat of hunger is their motto. I found it particularly interesting that the person wearing this fabulous marketing tool was not small, not medium, not even slightly over weight, but rather a prime example of my reason we need to start thinking for ourselves a bit more. Fast food has become a staple in the last few decades. Eating in the car on the go has become the norm in the last few decades. Obese defined by the National Institutes of Health (NIH): Body Mass Index (BMI) of 30 and above. I was as guilty as the next when it came to fast food. However, we as a family have started thinking for ourselves. 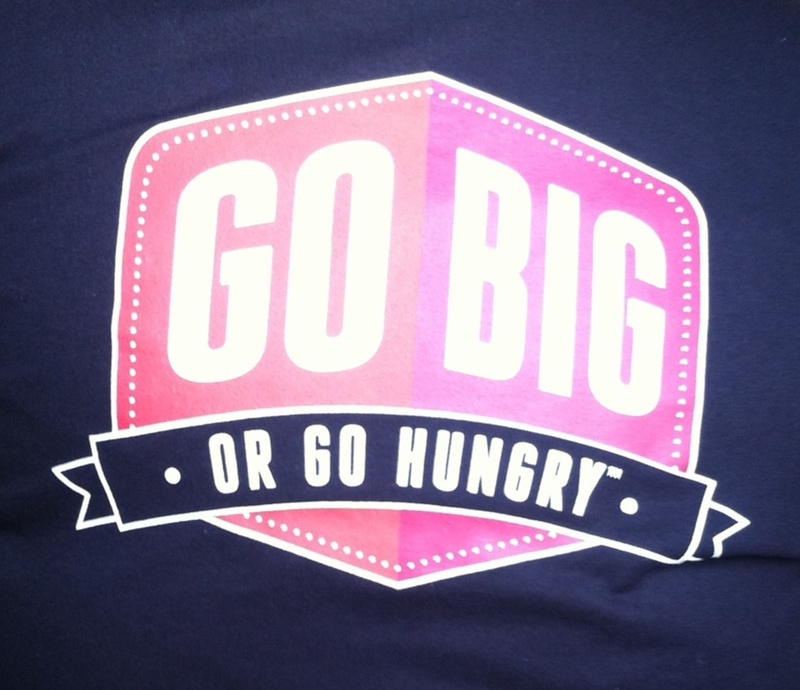 Now when I see “Go Big or Go Hungry” it reads “Go Big and Get Big” to me…..loud n clear….anyone else see it that way? Let’s start a revolution to think for ourselves. Block out alllll the crazy advertising we are suffocated with each day. Be your own person. If you want to “Go Big” go for it, but do it because YOU gave it thought and its the choice YOU want.